A prune, or prune fruit, is nothing but a dried plum. Prunes have been consumed for centuries, mainly to alleviate digestive complains. Find out everything about the benefits of eating prunes, their impressive nutritional content, how to consume them, and much more. Prunes are actually dried plums, and can be found under both names. However, not all plums are good to make prunes. The selected varieties need to meet special requirements, such as a high level of sugar content that enable them to be dried without fermenting while still containing the pits. Prunes are highly beneficial for the digestive system, as well as for bone structure and cardiovascular health. Relieving constipation. Prunes help balance sugar and water levels in stools, which allows for easier digestion. Strengthening bones. Prunes help the body absorb calcium better, thus promoting healthy bones and preventing osteoporosis. Additionally, science has shown that prunes may be also useful for preventing and treating anemia, supporting cardiovascular health and treating metabolic disorders, such as diabetes and obesity. The amount of sorbitol in dried prunes can reach 15 grams per 100 grams. The main active compound behind the medicinal value of prunes is sorbitol, a sugar alcohol that helps the stomach breaking down nutrients. Only a small amount of sorbitol is absorbed in the small intestine, and most of it reaches the colon, where it works with prunes' insoluble and soluble fiber, softening stools and facilitating regular bowel movements. The osteoprotective and cardioprotective properties of dried plums are attributed to their high levels of essential nutrients, mainly vitamin K (phylloquinone) and minerals, which promote cardiovascular and bones health, preventing blood clots, fractures, and osteoporosis. In spite of containing high levels of sugars, dried prunes are considered very healthy, and sorbitol is sometimes used as a natural sweetener. Other herbs with laxative properties are cascara sagrada, tamarind, and psyllium, whereas almonds, spinach, and soy also have osteoprotective actions. Prunes are regarded as one of the safest options for constipation relief. However, they contain traces of arsenic, which in large amounts can cause digestive upset and diarrhea. People sensitive to polyols (sugar alcohols) should consume dried plums in moderation or avoid them altogether, due to their high levels of sorbitol, which can cause gastrointestinal discomfort. Prunes contain moderate levels of oxalates, which tend to accumulate in the kidneys, forming crystals known as kidney stones. People with a history of kidney problems should limit their intake of prunes. On the nutritional side, prunes provide great amounts of vitamin K (phylloquinone), a fat-soluble nutrient that improves blood clotting and has been linked with higher bone mineral density, thus reducing the risk of fractures. Prunes are also an excellent source of dietary fiber and copper. While copper deficiency is a rare cause of anemia, low levels of this essential mineral inhibit iron absorption in the body. Copper also supports the health of blood vessels, nerves, immune system, and bones. Significant amounts of manganese also contribute to the good reputation of these dried fruits for bone health support. Additionally, good levels of potassium are crucial for controlling hypertension, as well as for relaxing blood vessel walls, which further helps lower blood pressure, whereas magnesium plays an important role regulating diverse biochemical reactions in the body, including protein synthesis, muscle and nerve function, glucose metabolism, and blood circulation. Other minerals, present in adequate quantities in prunes, are iron and phosphorus. 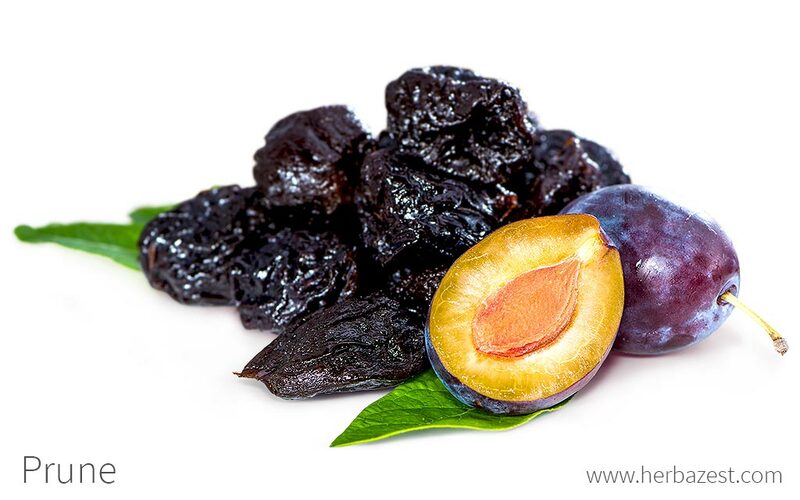 Good amounts of vitamins B2 (riboflavin), B3 (niacin), B5 (pantothenic acid), and B6 (pyridoxine) also contribute to the health benefits of prunes. All B vitamins, often referred to as B-complex vitamins, help the body metabolize fats and protein, as well as converting carbohydrates into glucose, which is used to produce energy. B-complex vitamins are needed for the proper functioning of liver, skin, hair, and eyes. They also promote the health of the nervous system and are needed for optimal brain function. 100 grams of prunes provide 240 calories, as well as 21% and 28% of the recomended daily value for carbohidrates and dietary fiber, respectively. Eating prunes, drinking them as a juice, or spreading them as a paste over toasts are popular ways to reap their health benefits. However, to treat specific conditions that require a certain amount of prunes every day, taking a supplement would be a better idea. Prunes are a great substitute of sugar in many recipes, as well as a flavor enhancer in both sweet and savory dishes. Dried. Consuming 10 prunes per day, as a part of a healthy diet, provides the vitamins and minerals necessary for building and maintaining healthy bones, as well as for relieving constipation. Juice. The laxative properties of prune juice are well-known, and this is one of the most popular ways of consuming prunes for constipation relief. Paste. The pulp of prunes can be taken by the spoon in order to regulate bowel transit and treat constipation. Capsules. Either in their hard or soft gel form, capsules are the most common form of consumption for treating constipation. Extracts. Made of pure prunes pulp, extracts offer not only an effective, soft laxative action, but also nutrients and antioxidant agents. Prunes are available year-round in major supemarkets and organic stores, whereas plums are often consumed fresh. Bottled plum and prune juice, as well as prunes' paste or jam can be easily found in grocery stores, pharmacies, and convenience stores, as well as through online retailers. 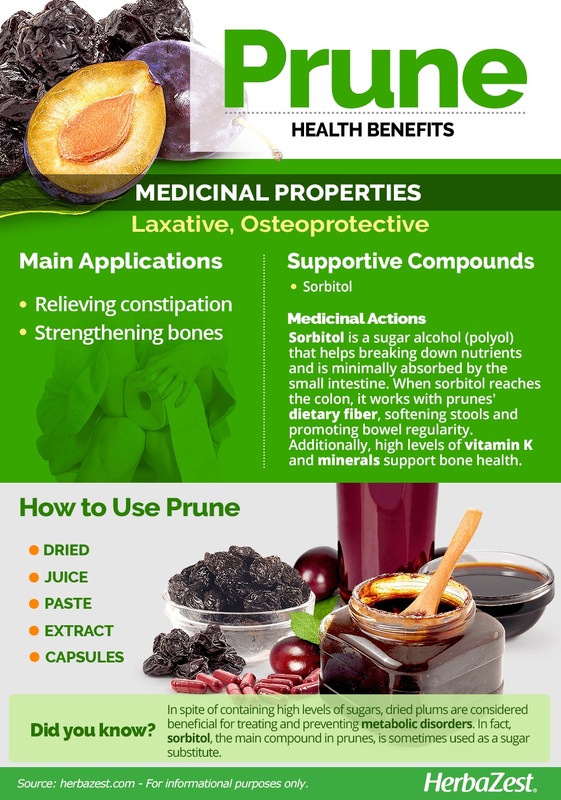 Prune supplements are mainly found in specialized health stores and pharmacies. In addition, there is a wide variety of choices, such as extracts and capsules, available through online retailers. Most Prunus species are native to northern temperate regions and accordingly adapted to diverse soils and climatic conditions. Temperate climates are the most suitable for plum trees to grow, since they need significant winter chilling in order to develop properly - at least 800 hours of temperatures below 45°F (7°C). Plum trees grow best in well-drained, clay or loamy soils. Plum trees need to be planted during the dormant season, before growth starts in late winter or early spring. It is essential for the trees to be planted away from frost pockets or windy sites. A sheltered, sunny spot will produce the best results. Plum trees need mulch of well-rotted farmyard manure around their base. Plums usually begin to bear fruit in 3-4 years. Plum trees are susceptible to brown rot, plum curculio, and bacterial canker. A netting or nylon mesh can be used, if necessary, to protect the crop from birds. Plum trees are medium sized, usually held to 15 - 18 feet (4.6 - 5 m) by pruning. The leaves have shallow toothed margins and the flowers usually five pink or white petals that appear before leaves. Before being dried and transformed into a prune, the plum fruit is typically medium sized, 1 - 1.5 inches (2.5 - 4 cm) diameter, with oval shape and a firm, meaty flesh, with a stone or pit (endocarp) enclosing the seed. The peel is smooth, with a waxy surface and adheres to the flesh. The plum tree (Prunus domestica), also called European plum, belongs into the Roseaceae family, which contains flowering plants, including approximately 2,830 species spread out over 95 genera. Other well-known members of this large family are apple (Malus domestica), blackberry (Rubus fruticosus), and pear (Pyrus communis). The Prunus genus comprises 63 species, including apricot (Prunus armeniaca), cherry (Prunus spp. ), and almond (Prunus dulcis). It is believed that Prunus domestica, the most common source of prunes, is a hybrid from two plum species, P. spinosa and P. cerasifera var. divaricata. Prunus domestica, the most popular plum species, have only two varieties: Prunus domestica var. domestica and Prunus domestica var. insititia. There are thousands of plum cultivars, adapted to a variety of soils and climate conditions. However, among the most important varieties are 'Sugar', 'Italian', 'Agen', 'Imperial', and 'Epineuse'. The main variety grown in the U.S. is the 'Improved French' plum. Researchers believe plums were first domesticated into a food crop in Central Asia approximately 2,500 years BCE. However, the first records of their use as a healing agent date back to 479 BCE, when they were listed in a Chinese medical treatise as an aid against constipation. After Alexander the Great's conquest helped plums find their way into Europe, they were quickly adopted by all different Mediterranean cultures, and by 65 BCE, they were already a major commodity in Pompeii. PLUMS, FRESH AND DRIED, HAVE BEEN ONE OF THE MOST POPULAR FRUITS EATEN BY HUMANS FOR CENTURIES. The United States is currently the largest producer of fresh and dried plums. Most of commercial national production occurs in the Pacific States, New York and Michigan; but plum is cultivated in all areas of U.S., except the South and the coldest regions. Around 70% of the prunes consumed throughout the world are imported from California, which grows 99% of the U.S. prunes' supply. More than 1,000 cultivars of plums are grown for drying into prunes, which reach the market quicker than fresh plums. Baking. Pureed prune can be used as a fat substitute in baking recipes. Candy. Prunes can also be used in preparing jellied candies. Cosmetics. Kernel oil extracted from the pit of the prune is used in the cosmetic industry as a softener. USDA Plants Database, Genus Prunus L.